Will a loved one be a Ramadan road victim? « Being The Safe Driver! Behind The Wheel! Driving During Ramadhan, Faizul Haque, Fasting and Driving!, More Accidents in Ramadan, Times of Oman Article, Will a loved one be a Ramadan road victim? A Times of Oman Article. Muscat: While for families across Oman this Ramadan will be a time of spiritual reflection, for some it will be tinged with grief as an annual surge in road traffic accidents claims their loved ones. Today the Times of Oman joins hands with the Oman Road Safety Association (ORSA) to urge all drivers to have a safe and blessed Holy Month and take precautions to guard themselves and their fellow road-users. Shaima Al Lawati, chief executive officer of ORSA, said that every year many fatal road accidents occur during Ramadan that could easily be avoided. She said people’s daily regimen and routine is different during Ramadan, and some stay late for prayers or social obligations, while others have irregular eating style that results in a feeling of fatigue setting in. Often it is due to lack of food intake, or because they feel full and heavy as a result of excessive eating. Both affect the driving behaviour of people and their ability to focus on the road. Therefore, those who have to be behind the wheel must take care of certain issues to avoid accidents. “If you feel any of the signs below, then you are feeling fatigued and not fit to drive,” said Saima Al Lawati. “You yawn frequently, your eyes feel sore or tired, you’re bored, irritable, or restless, it takes you longer to react, it’s difficult to concentrate, you don’t check your driving mirrors as frequently as required, you wander off your lane, your driving speed is inconsistent, you find yourself driving faster or slower, you brake suddenly, you miss an exit or a turn, you start ‘seeing things’, you have difficulty keeping your head up or eyes open. According to data provided by the directorate general of traffic, out of 8,209 accidents in 2012, 4,328 were due to speed which resulted in 595 deaths for and 25 accidents due to fatigue which led to 37 deaths. The data also showed that Ramadan comes in one of the few months of the year when the road accidents spike. 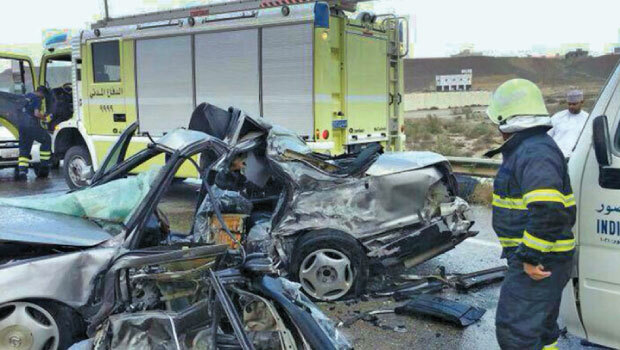 The number of accidents in June, July and August 2012 was 771, 700 and 628. In 2013, the number of accidents came down to 7,201 which killed 905 people and injured 9,965. ORSA recommends taking regular breaks when driving for long periods and when tired, pull over at a safe place and rest, if possible; drive during daylight hours, and if you feel drowsiness, postpone your trip, have a friend drive you, or take a bus, or a taxi, she said. Shaima Al Lawati also said if people want to drive a car for a longer distance, they must have enough sleep and listen to their body clock before taking the wheel. She said that people who have to drive for long distances should stop every two hours for at least a 15 minutes nap, and then start the journey again. If even that does not work out, they should call a friend or a family member to help them reach the destination or hire a taxi instead of taking any risk to drive in this condition. In addition to abiding by all the traffic rules, they should remain a bit more careful on the road as other drivers would not be aware of their physical condition. Shaima said that it has been widely noticed that people speed up their cars to reach their homes or other destinations for Iftar on time. “We discourage this practise strictly as it is hazardous to drive fast. The best thing to do is to start well in advance. She said that while planning a journey, people should take into account the minimum speed on the road and the likely traffic jams and not the maximum speed of their cars. “Start well in advance and carry water or dates to breakfast if you are unable to reach your destination on time. “This is better and safer than speeding on the roads,” said Shaima Al Lawati.